Get ready for a steamy summer! This year’s hottest lip colors are a smokin’ color saturation that’s sure to go to your head. If a color is bold, bright and daring, it’s sure to be on-trend, so try one or try them all to figure out which of summer’s hottest lip colors is right for you. Coral lip colors range from a subtle orangey coral pink to a fiery hot red-orange that calls to mind a summer sun setting over the ocean. These variations provide ample opportunity for you to test coral lip colors until you find the right fit. 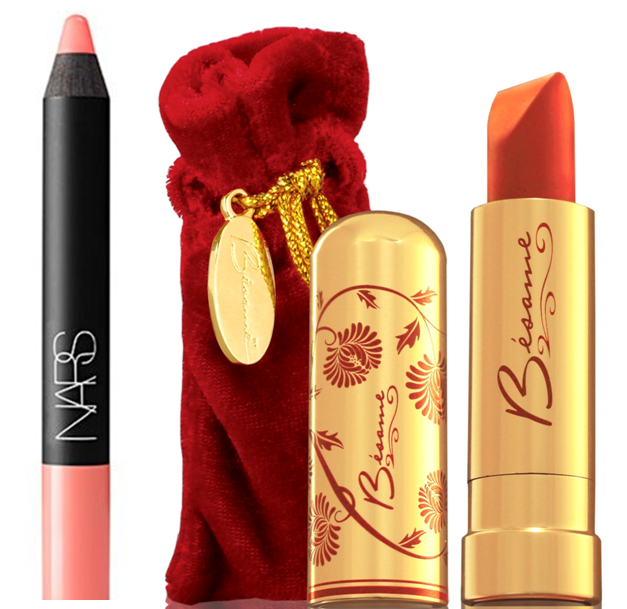 Start with something simple like the NARS Velvet Matte Lip Pencil in Bolero, and work your way up to a flaming hot lip color like the Carmine color developed by Besame, the vintage-inspired makeup line used in Mad Men. No matter what coral color you settle on, keep the rest of your makeup simple, opting for shades of off-white and turquoise to complete your tropical look. Coral pinks aside, if you’re going to be wearing a pink lip color, steer away from the lip-matching shades and stick to brighter varieties like hot pink, fuchsia and magenta. Just make sure you’re choosing options with fully-saturated color — subtlety is not a factor when it comes to wearing shocking pink! To get the bold look, pick up the Saint Germain Paris lipstick in Rose Violet or Bodyography’s Electric Lip Slide in Cheeky Baby. 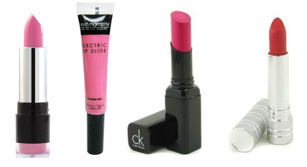 If you’re looking for something a little less hot-pink and a little more fuchsia or magenta, try Calvin Klein’s Delicious Fusion Moisturizing Lip Color in Fuchsia or Clinique’s High Impact Lip Color SPF 15 in Magenta Rose. 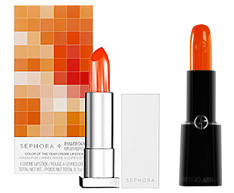 Pantone’s Color of the Year for 2012 is Tangerine Tango, and cosmetics enthusiasts have followed suit! If coral lip color doesn’t have enough citrusy orange to suit your fancy, take it up another notch with true tangerine lip tones. Try Sephora’s Color of the Year Tangerine Tango Creme Lipstick or Armani Beauty’s Rouge Sheer d’ Armani Lipstick in Acid Tangerine. You can never go wrong with a bold, bright red, but rather than look for reds with darker undertones, choose a brighter hue. 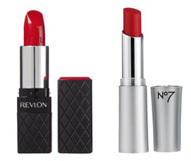 We love Revlon ColorBurst Lipstick in True Red and Boots No7 Sheer Temptation Lipstick in Smoulder.